And now a word about….Outdoor Balloon Arches. It’s never too early to book your spring or summer event. With a staff of 8, we do our best to accommodate EVERYONE…..but it’s always best to PLAN EARLY. Outdoor arches attract attention. They make a great photo opportunity. And they help create memories. 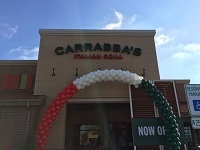 When guests pull up and see a balloon arch….they know that you’ve taken the time to plan a significant event. 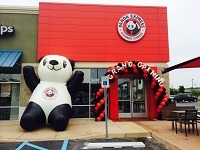 Below are some Grand Opening Balloon Arches. 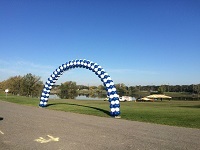 We are also hired to do balloon arches for company picnics and customer appreciation events. 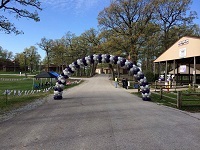 Fundraisers/Walks are other events which usually include a balloon arch. 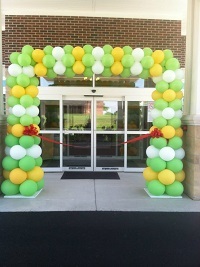 A big balloon arch makes a big difference…..as seen in these photos below. Planning outdoor events always involves some risk. If the weather is extremely tempermental…..we will have a PLAN B. Plan B usually involves Balloon Columns. If an outdoor event is postponed, we will postpone your arch for you provided that we haven’t started inflating anything yet (24 hours advance notice required). We will not issue refunds for arches. But we WILL change the date for you. We require electricity for inflating the balloons. An indoor/sheltered work space is requested. When the event is over, our team will come back to your event to retrieve the arch kit. The arch kit is the property of It’s My Party. 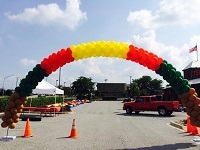 For questions about balloon arches in Northwest Indiana for your company picnic, employee appreciation event, fundraiser, walk, grand opening or other type of event…..ask for Amy at It’s My Party 219-322-7777.